Many days, weeks, months and even years have gone by since my last installment of FM was posted. That does not mean that I've not been making frittatas! In fact, I make them almost every weekend. With that in mind, I'd like to share some ideas that I've concocted over the last few hoo-haws so as to inspire you. 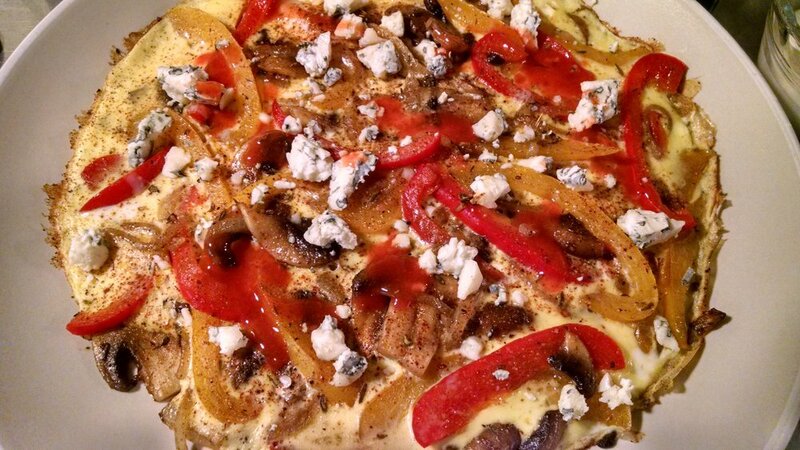 A simple, yet very tasty frittata made of red and yellow peppers, mushrooms, vidalia onions, one egg and crumbled blue cheese. Add Frank's Red Hot Sauce to taste. Another simple one, home fries, onions and matchstick soppressata (that's soppressata sliced into thin disks and then sliced super thin into, yes, matchsticks) with more blue cheese crumbled on top. Do I detect a pattern? Home fries again, with mushrooms, onion and topped with sriracha mayo and daikon radish kimchi (made by my daughter!) Now we're getting somewhere! That's it for now...there will be more, oh yes, there will be. Hope these give you some ideas! Spinach, kielbasa and onions, oh my! Another Fritatta weekend has come to SPC. This one features spinach, onions, kielbasa and to add to the fun a Parmesan peppercorn cream sauce and homemade focaccia bread! The sauce really put this one over the top. If you want to know how to make a cream sauce, watch SPC Episode #4 - the base sauce from that is the starter for this one! Sweet Corn (from frozen), button mushrooms, homemade pasta, bacon, garlic, onions and roasted chicken breast. Cheddar cheese will be added on top at the end. Yes, yes, yes! I like putting rice in my fritattas as a binder and I thought, why not pasta. I had made some pasta the night before and just plunked in a bunch to join the fun. Ladies and gentlemen, Mr. and Mrs. Yum! There's nothing more satisfying than taking leftovers and re-purposing them in such a delightful way. Actually, there are things that are more satisfying, but this is still really cool. Folks, I can't get enough of frittatas. If you don't know what one is, it's basically any collection of ingredients put in a frying pan with scrambled eggs cooked around them and usually shredded, melted cheese on top. At least that's my definition. The thing is that I find myself making these little (actually not that little) monsters at least once every week. You can have them for breakfast, lunch, dinner or snacks (that's a large snack). I also have been taking pictures of ones that I've made and have quite a collection that I've started posting on Facebook.